This CLE program provides information regarding current fraud schemes from the front line regulators. Understand emerging trends in securities fraud and identify potential threats. Identify potential red flags associated with different types of financial fraud. Know whom to contact to report potential fraud. Anthony Cavallaro is a senior vice president and the head of the Central Review Group of FINRA’s Office of Fraud Detection and Market Intelligence. He is responsible for managing two units that review and investigate regulatory filings, complaints and other matters received regarding violations of SEC and FINRA rules and regulations. Mr. Cavallaro reports to the Department’s Executive Vice President. Prior to his current role, Mr. Cavallaro was a vice president in the Member Regulation Department and also served in the Enforcement Department of FINRA where he managed two units that investigated and prosecuted violations of securities laws and regulations. Mr. Cavallaro was a vice president at the New York Stock Exchange and began serving at FINRA when NYSE Member Regulation and Enforcement consolidated with NASD to form FINRA in 2007. Prior to joining the NYSE in 1997, Mr. Cavallaro was an Assistant District Attorney in the New York County District Attorney’s Office where he was responsible for investigating and prosecuting various criminal matters including white-collar cases. Mr. Cavallaro received his law degree from St. John’s University School Law and a B.S. in finance from Fordham University, College of Business Administration. He is a military veteran and retired with the rank of major after 20 years of service in the US Army Reserve. 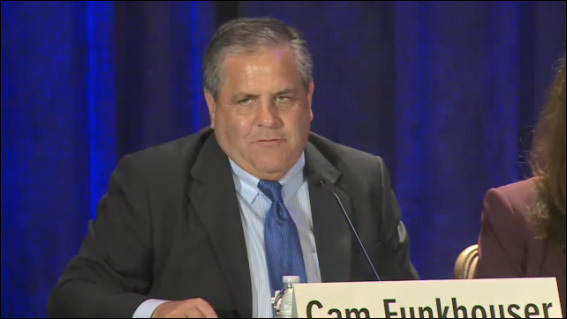 Cameron Funkhouser is Executive Vice President of FINRA’s Office of Fraud Detection and Market Intelligence. He has been with FINRA, formerly known as NASD, since 1984, serving in various roles of increasing responsibility with a focus on the surveillance of securities traded on The Nasdaq Stock Market, New York Stock Exchange, American Stock Exchange and the over-the-counter markets. Mr. Funkhouser has extensive experience conducting securities fraud investigations and is regularly called upon by civil and criminal law enforcement authorities to provide training, technical assistance, investigative/litigation strategy consulting and expert testimony. Currently, he is responsible for overseeing the Office of Fraud Detection and Market Intelligence, which includes the Insider Trading and Fraud Surveillance units responsible for monitoring the trading activity of more than 10,000 publicly traded securities, FINRA’s Complaint Center and FINRA’s Whistleblower program. Mr. Funkhouser and his staff have been responsible for uncovering numerous cases of Internet fraud, insider trading, market manipulation, Ponzi schemes and other white collar misconduct, which have been successfully investigated and prosecuted by FINRA, the Securities and Exchange Commission and other law enforcement agencies across the country and internationally. He graduated from Georgetown University with a bachelor’s degree in business and George Mason University with a law degree. Mr. Funkhouser is a member of the Virginia State Bar. Susan Schroeder is the Deputy Chief of FINRA’s Department of Enforcement, responsible for Enforcement’s home office in New York. Prior to joining FINRA, she was a partner in WilmerHale’s Securities Litigation and Enforcement practice, where she specialized in SEC, FINRA, and state enforcement actions. She began her legal career as a litigation associate at Kirkland & Ellis. She received her J.D. from NYU School of Law, her M.A. from the University of California at Davis, and her B.A. from Georgetown University. She is a member of the New York bar. Christopher Kelly serves as the Regional Chief Counsel for the North Region of FINRA’s Enforcement Department. As Regional Chief Counsel, Mr. Kelly oversees the work of the Enforcement Staff in the Boston, New Jersey, and Philadelphia District Offices. Prior to joining FINRA, Mr. Kelly served as Deputy Chief of the Criminal Division at the U.S. Attorney’s Office for the District of New Jersey. In that role, Mr. Kelly supervised more than 35 Assistant U.S. Attorneys in the Office’s white collar units: Economic Crimes, National Security, Healthcare and Government Fraud, and Cybercrime. Prior to his promotion to the position of Deputy Chief, Mr. Kelly served as the Chief of the Economic Crimes Unit at the U.S. Attorney’s Office, where he oversaw the Office’s prosecution of complex economic crimes, including crimes involving insider trading, securities fraud, tax evasion, bank fraud, corporate fraud and embezzlement. Mr. Kelly also served as the lead prosecutor on several complex matters, including U.S. v. Tiger Asia, one of the first ever criminal prosecutions of a hedge fund. Mr. Kelly graduated from Duke University and Harvard Law School. Prior to joining the U.S. Attorney’s Office, he was an associate at the law firm Dechert LLP. Mr. Kelly also clerked for the Honorable Joseph E. Irenas, U.S. District Court Judge for the District of New Jersey.